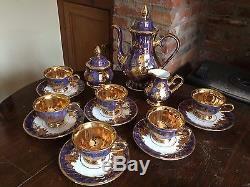 This is a stunning vintage Turkish/Persian china coffee set. 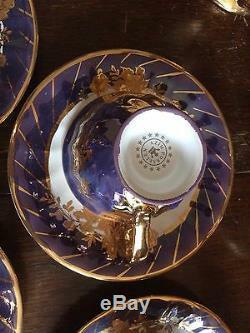 It is indigo/purple/blue lustre with gold inside and gold floral design. There is a coffee pot, 6 cups and saucers along with creamer and lidded sugar bowl. All pieces are in immaculate condition. For collection only from DE65 5PP. Other things you may wish to know.... I pride myself on getting your order to you quickly. There are some larger items i. Furniture which will be sent by courier. Items can be collected from South Derbyshire (DE65) with prior arrangement. I post non-fragile items, weighing under 2kg, worldwide with the exception of Italy and USA I no longer post addresses in these two countries. I hope you will be delighted with your item and service and that this will reflect in the feedback you leave. If there is anything else I can help with please get in touch and I will get back to you as soon as I can sometimes I do get very busy though but I do try to answer all queries within 24 hours! Thank you for visiting me at Vintage Pink Gifts and Crafts. 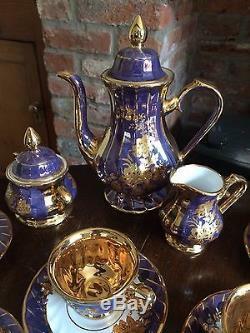 The item "Vintage PERSIAN'Wizv Porselen indigo/gold lustre COFFEE set for 6 S. Derbyshire" is in sale since Tuesday, February 28, 2017. This item is in the category "Pottery, Porcelain & Glass\Porcelain/China\Other Porcelain/China". The seller is "*vintagepink*" and is located in Derbyshire. This item can't be shipped, the buyer must pick up the item.